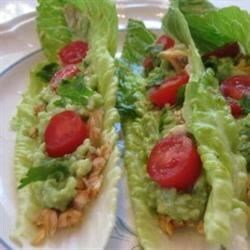 Fish Tacos in Lettuce "Shells"
"Baked tilapia, flaked and placed in romaine lettuce leaves with tomatoes, cilantro, and avocado salsa verde." Combine Cajun seasoning, chili powder, paprika, garlic salt, and ground black pepper in a bowl. Sprinkle on each side of tilapia fillets, covering evenly; cover each side with lemon juice. Place fillets on a baking sheet. Bake in the preheated oven until cooked through, 8 to 10 minutes. Shred tilapia; place equal portions in each romaine leaf. Blend avocado, onion, jalapeno pepper, garlic, and water together in a blender to make the avocado salsa verde. Stir in cilantro. Top prepared tacos with salsa verde and cherry tomatoes. Instead of tilapia I used sole but other than that remained true to the recipe. Very tasty. I will be making it again. I loved this recipe. I am making this for the third time in as many weeks.